There's no point in arguing whether baseball or softball is the better game. They're close cousins with unique athletic challenges. Ask any ballplayer. They'll tell you there is a big difference between hitting a ball thrown underhand at top speed and hitting a baseball. Pitching a softball that fast is quite the trick too. So the next time someone tries to tell you softball is only for girls. Have them step up to the plate and see if they can handle the heat. 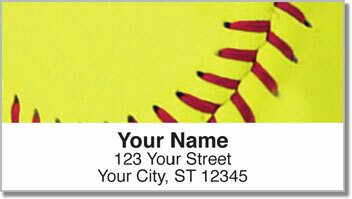 These eye-catching, sports-themed mailing labels are the perfect way for softball players and fans to top off outgoing mail. 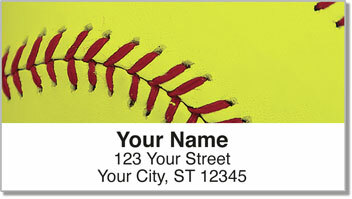 A self-adhesive backing lets you simply stick them on each envelope. No more messy handwriting on your letters and packages! 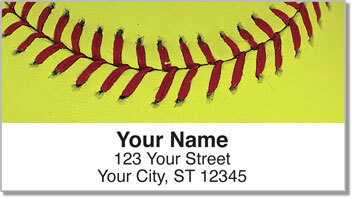 Get your own Classic Softball Address Labels now! 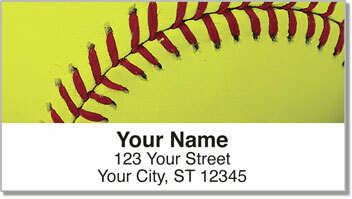 Matching checks and a checkbook cover are also available. Make it a complete set!